Students learn some ways to investigate the sense of hearing and find out how to plan and conduct their own experiments. In the "CLASS EXPERIMENT," students discover how we are able to judge where a sound is coming from with our eyes closed, and whether this judgement is easier for noises coming from specific directions. In "TRY YOUR OWN EXPERIMENT," students design new experiments, investigating, for example, if one ear is as good as two in locating sound sources; how the size and shape of the external ear affect hearing; or whether classmates know how to take care of their hearing. SUGGESTED TIMES for these activities: 45 minutes for introducing and discussing the activity, 45 minutes for the "Class Experiment;" and 45 minutes for brainstorming and "Try Your Own Experiment." Our ears alert us to events in the environment, and they detect that special human form of communication, speech. Our hearing mechanisms accomplish these tasks by sensing sound waves, which are changes in air pressure, and converting these changes into electrical signals that the brain can analyze and interpret. Just as we do not actually smell with the bumps on our faces called noses, neither do we perceive sound solely with the flaps we call ears. Although hearing begins with the ear flap or pinna, the receptor cells that change sound energy into the electrical currency of the nervous system lie deep inside the temporal bone of the skull. Like olfactory cells that detect odors, auditory receptor cells (also called hair cells) are recessed from the surface of the body. Unlike olfactory or taste receptors, however, hair cells are not renewed when they die or are damaged. Although taste and olfactory cells interact directly with molecules in the environment , auditory receptors are quite far removed from the phenomena they detect. Sound waves are converted into vibrations in a fluid in the inner ear, and these vibrations indirectly move the hair cells, which then send electrical signals to the brain. The next few paragraphs explore in detail the way this happens. The folds and ridges of the pinna are not just decorations (or for holding earrings) - they serve to channel sound efficiently into the ear canal and to the eardrum, or tympanic membrane, at its end. The pattern of folds captures sounds in a way that helps us localize the origin of sound in space, especially on the vertical axis. (Other mechanisms also help us localize sound: these will be discussed later.) The ear canal carries sound to the eardrum, and its lining produces ear wax to keep the eardrum and canal from drying out and to trap dirt before it gets to the eardrum. (See Figure 1.) When sound waves vibrate the eardrum, sound energy is transferred to the middle ear. The middle ear is a small, air-filled pocket bounded by the eardrum on one side and the oval window of the inner ear on the other. This pocket is connected to the common mouth and nasal cavity, or pharynx, by the Eustachian tube (Figure 1). The Eustachian tube allows air pressure to equalize between the outside of the eardrum (surrounding atmosphere) and the inside of the eardrum (the middle ear). This is also the pathway that allows infections from the mouth and nose cavities to enter the middle ear, causing the common ear infections of childhood. The middle ear houses the three smallest bones in the body, the malleus, incus, and stapes (hammer, anvil, and stirrup), which form a chain of levers connected by joints. The malleus is attached to the eardrum by ligaments, as is the stapes to the oval window. Thus, this series of membranes and bones forms a pathway that carries vibrations from the eardrum to the inner ear. The stapes, the last bone in the chain, pulls or pushes on the membranous oval window when the eardrum and the three bones are vibrated by sound waves; the oval window is a closed membrane, but acts as the entrance to the inner ear for sound energy. What does this pulling and pushing on the oval window do in the inner ear? A look at the structure of this area helps show how sound wave energy is transmitted to fluid in the inner ear. 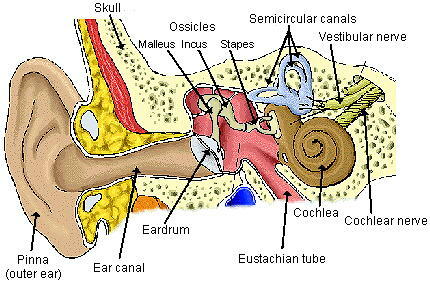 The inner ear is composed of the cochlea, from the Greek word for snail, and the semicircular canals (Figures 1 and 2). (These latter canals are part of the vestibular system for balance and will not be considered here.) The cochlea is a membranous tube that is covered by a very thin layer of bone and wound around a tiny central bone (the modiolus) into a shape that resembles a snail; it is only about nine millimeters across - well under one-half inch. 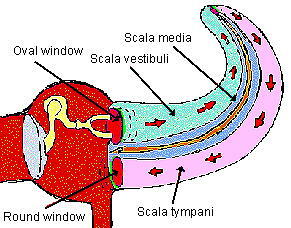 The cochlea is filled with a special fluid, and the pushing and pulling of the stapes on the oval window moves the fluid in this coiled tube. If we stretch out the cochlear tube, as in Figure 2, we see that inside are actually three tubes, two larger and one smaller, with the small tube, (the scala media) lying between the two larger ones. All three tubes are filled with fluids, which vary somewhat in composition. The fluid in the top-most tube in Figure 2 is set in motion by the piston-like movements of the stapes on the oval window. As indicated by the arrows, the vibrations travel into the fluid of the upper tube of the cochlea and around the tip of the organ into the fluid of the lower tube. The pushing or pulling of the oval window on this fluid must have a release or dampening mechanism: this is provided by the round window, a membrane located at the end of the lower of the large tubes in the figure. Forming the lengthwise partition between the lower large tube and the small tube is the basilar membrane, shown in Figure 3. On this membrane sit the stars of the show in the auditory system, the auditory receptor cells, or hair cells. When the basilar membrane moves, it stimulates the hair cells, which then send signals about sounds to the brain. The pinna captures sound waves and channels them through the ear canal to the eardrum. Vibrations of the eardrum pass along the three bones of the middle ear, with the base of the stapes then rocking the oval window in and out. The membranous oval window acts something like a piston in a hydraulic system: it pushes and pulls on the enclosed fluid of the cochlea. The fluid vibrations move the basilar membrane, and this motion activates auditory receptor cells (hair cells) sitting on the membrane, which send signals to the brain. Figure 3. Cross section of the uncoiled cochlea, showing the three tubes and the hearing organ, the organ of Corti. Hair cells sit on the basilar membrane and are innervated by fibers from the auditory nerve, one of the cranial nerves. Image used with the courtesy of http://medic.med.uth.tmc.edu/Lecture/Main/ear.htm. The motion of the fluid in the cochlear tubes sets the basilar membrane in motion, generating traveling waves along its length. These are somewhat like the waves produced in a long rope that is grasped at one end and flicked. The basilar membrane is much more complicated, though. To begin with, it is not uniform throughout its length, but rather is relatively wide and thin at the apex (top) of the cochlea, and narrow but thick at the base. Because of these properties, a sound wave in the cochlear fluid produces a peak amplitude or height of displacement of the membrane at a certain point along its length. This point is determined by the frequency (number of waves per unit time) of the sound that originally produced the fluid motion. High frequencies cause a peak wave near the base (narrow part of the membrane), and low frequencies produce their peaks toward the apex (broad part of the membrane). Thus, the basilar membrane is sometimes called a frequency analyzer. In addition, the hair cells on the membrane are also tuned to particular frequencies, so that each hair cell responds best to sound of a given frequency. This anatomy or "geography" of the basilar membrane and hair cells produces a tonotopic map along the membrane. This means that, as with geographic maps, once you know some landmarks and the scale of the map, you can calculate the point where sound of a particular frequency will have its peak, because the system is ordered and predictable. Further, groups of responding neurons in the brain auditory areas also contain tonotopic maps (see below). So far, we have considered how sound gets to the auditory receptor cells. But just how do these cells work? How do we tell sounds apart, how do we recognize high and low frequency sounds, and how do we analyze complex sounds such as human speech? The hair cells sit on an epithelial ridge called the organ of Corti on the basilar membrane; the ridge contains several other types of cells that support the hair cells. The receptor cells are called hair cells not because they sprout hairs, but because their apical or top ends are covered with cilia, which under the microscope look a bit like hairs. Over the top of the cilia lies a gelatinous membrane, sandwiching the hair cells between itself and the basilar membrane. The complex, relative movements of these two membranes activate the cilia of hair cells, causing the cells to undergo a change in the electrical potential across their cell membranes. When specific changes occur in this electrical state, neurotransmitter molecules are released from the bottom or basal parts of the hair cells. Thus, the cilia are essential in transducing, or changing, the mechanical energy of the basilar membrane into electrical changes in the hair cells. As mentioned above, hair cells are tuned to the particular frequencies that activate the portion of the basilar membrane where they reside. Hair cells are modified epithelial cells and do not have dendrites and axons as neurons do, but they communicate, as many neurons do, by releasing neurotransmitter. They release the neurotransmitter at junctions or synapses that they form on branches from neurons whose cell bodies are in a ganglion (group of neurons) just outside the cochlea. The axons from the ganglion neurons form the auditory nerve, which carries signals into the first stop in the brain, the cochlear nucleus. Once information from one ear goes to the cochlear nucleus on that side of the head, the neurons in this nucleus send information to identical higher centers on both sides of the brain. As shown in Figure 5, some of the processing stations are the superior olivary nucleus, inferior colliculus (in the midbrain), medial geniculate nucleus (in the thalamus), and the auditory cortex. To avoid confusion, Figure 5 shows only the pathway on one side from the brainstem to the midbrain. From the auditory cortex, messages go to other areas of the cerebral cortex for interpretation of the meaning of sounds. In the cochlear nucleus, the first brain relay station for sound, signals encoding sounds are not just passed on, but rather are "dissected" and sorted first. This means that different features of a sound, such as frequency, intensity, or onset and offset (beginning and ending of a sound) are carried to higher brain centers separately. This sorting out of the features of stimuli and sending messages forward in parallel nerve pathways is a common and important attribute of brain sensory systems. One of the big tasks of researchers is to find out how areas in the cerebral cortex use input from these parallel pathways to interpret the original sensations - in this case, the original sounds. When a sound occurs at the extreme left of a subject, the arrival of the sound at the left ear is about 600 to 700 microseconds (millionths of a second) earlier than at the right ear. Further, the head acts as a sound barrier, so the sound is a little louder in the left ear. How does the timing and intensity of sound in the two ears tell the brain where the sound source is? This processing is carried out in the superior olivary nucleus (SON) of the brainstem. Axons coming into the SON from the cochlear nuclei form synapses successively across a linear series of SON neurons, as shown in Figure 6. Each neuron here gets messages from cochlear neurons in both ears, and in order to fire a signal to higher brain centers, each must receive simultaneous messages from the two cochlear nuclei. Because a sound from, for example, the extreme left side of a person arrives later in the right ear than the left, hair cells and neurons from the right ear send their signals slightly later than those from the left ear. Each SON neuron is activated only by simultaneous input from the two ears, so that when, for example, signals from axon d1 from the right and d2 from the left ear coincide on SON neuron d, it fires. Through experience, we learn that when neuron d fires, the sound is, for example, at 50o to the left of straight ahead. If neuron b fires, this could mean that the sound originates at 20o to the left. Neurons in another part of the SON employ intensity cues rather than arrival-time cues. Again, the neurons need simultaneous input from the two ears to fire, but in addition, they respond best when the sound intensity on one side of the head exceeds that on the other by a certain amount. Note that it is hard to differentiate sounds coming from directly in front of you from those originating directly behind you. Both sounds are equal distance from the two ears, so there is no difference in timing and intensity, information that our brains need to localize sound in the horizontal dimension. In the experiments in the Student and Teacher Guides accompanying this unit, students see how this mechanism works. Figure 6. Schematic of how sound is processed in the superior olivary nucleus (SON). A sound arriving earlier at the left ear elicits signals more quickly in the SON than those from the right ear. At some point, as the signals from the two ears travel across the linear array of neurons in the SON, they converge on one neuron and activate it (neuron "d" in this illustration). This processing is carried out simultaneously in the left and right SONs, but only one is shown here. The frequency mapping of sounds along the basilar membrane is carried throughout the auditory brain centers. This means that neurons in the cochlear nucleus that respond to progressively higher frequencies are found in an orderly progression along an axis of the nucleus. The superior olivary nucleus, midbrain centers, and auditory cortex also contain tonotopic maps. Maps for locations of sound origins are also established in certain brain centers. These are spatial maps, similar to such maps for the touch system, and are found in groups of neurons separate from those forming tonotopic maps. A composite sound such as a vowel sound in human speech usually has three dominant frequency components. The movement of the eardrum and ear bones receiving such a sound is very complex, but when the sound reaches the basilar membrane, the frequency components are sorted out. Each of the frequency components sets off a separate travelling wave and each wave produces its peak at the position on the membrane that responds best to that frequency. Next, the hair cells on the membrane at each peak send signals indicating to higher centers that a certain frequency of sound has been detected. What happens when signals from language sounds are sent to higher centers? So far, this has not been an easy question to answer. When researchers try to find which cortical centers and cells are involved in neurological functions, they often inject tracer materials into animal brains, perform experiments, and then dissect the brain to find out what areas were affected. Language processing has been difficult to study because it is a uniquely human trait and such experiments cannot be done on people. Studies of sonar and echolocation in bats have provided many insights into the processing of complex sounds. Another way scientists find out about brain areas used in language is to study people with language problems. They then either study those patients' brains after natural death, or before death with techniques such as magnetic resonance imaging (MRI), which allows them to see the damaged areas and hypothesize about the functions of those areas. Researchers are now also using positron emission tomography (PET) to study brain function during language processing in normal individuals. PET is a non-invasive procedure that shows local changes in blood flow and metabolism that occur when the brain is working-in this case, working to interpret spoken language. Through studies such as these, scientists have discovered many brain subdivisions for processing different aspects of language. The area for comprehending spoken language, for example, contains separate areas for decoding the meaning of words and for understanding the relationship of words in a sentence. These studies are opening new windows on how we decode language. About 28 million people in the United States have hearing loss significant enough to interfere with understanding conversations, and about one third of people over the age of 75 have difficulty hearing. Doctors generally divide hearing loss into conductive and sensorineural loss. The first occurs when something happens to the ability to transfer sound waves from the outer to the inner ear. The second results when damage occurs to the inner ear (frequently to the hair cells) or the auditory nerve leading to the brain. These two types of loss are both types of peripheral deafness, meaning they are caused by problems outside the central nervous system (brain). Central deafness is rare, because as pointed out earlier, once sound information reaches the brainstem, it is sent to many stations on both sides of the brain. In order for significant hearing loss to occur from damage to these redundant areas, the brain injury would be so extensive that many other functions would also be disrupted. Tumors, objects in the ear canal, or repeated ear infections that damage the eardrum can cause conductive hearing losses. Another cause of conductive loss is otosclerosis, a genetic condition that causes the middle ear bones to degenerate. Infectious diseases such as German measles, mumps, meningitis, and syphilis can cause sensorineural deafness. High blood pressure, multiple sclerosis, and diabetes can also lead to this type of hearing problem, but most sensorineural deafness-probably half of that found in children-is genetic, with large extended families affected. Exposing your ears to loud noises can also lead to sensorineural hearing loss by destroying the hair cells of the inner ear. Further, high doses of some medicines can damage hair cells and nerves, as can trauma from accidents. If the underlying cause of conductive hearing loss is treated, hearing can often be restored. For example, treating allergies and infections can reduce swelling and fluid in the ear, and replacing middle ear bones with tiny metal prostheses can greatly improve hearing in cases of otosclerosis. But antibiotics and surgery cannot treat sensorineural loss: if loss is not complete, a hearing aid may help-these contain a tiny microphone and amplifier to increase volume, and now many are small enough to fit into the ear canal. For profound (complete) loss in both ears, some people have turned to cochlear implants that can help people hear. At this time, help for genetic forms of deafness are limited (i.e., cochlear implants; metal replacement for ear bones). For other causes, people should consult a doctor when an ear infection occurs or when symptoms such as pain in the ear, constant ringing, dizziness, discharge, or bleeding occur. Another critical behavior for preventing hearing loss is to avoid exposing ears to loud noises, either by avoiding noisy situations or by using earplugs or ear covers. High noise levels damage or kill hair cells. Decibel levels that damage hearing can be found at http://faculty.washington.edu/chudler/bigear.html. Although students do need direction and practice to become good laboratory scientists, they also need to learn how to ask and investigate questions that they generate themselves. Science classrooms that offer only guided activities with a single "right" answer do not help students learn to formulate questions, think critically, and solve problems. Because students are naturally curious, incorporating student investigations into the classroom is a logical step after they have some experience with a system. Bellamy, M.L. and Frame, K. (Eds.) (1996). Neuroscience Laboratory and Classroom Activities. National Association of Biology Teachers and the Society for Neuroscience, pp. 21-35. Camhi, J. M. (1984) Neuroethology; Nerve Cells and the Natural Behavior of Animals. Sunderland, Massachusetts: Sinauer Associates, Inc.
Shepherd, G.M. (1994). Neurobiology. Third ed., Oxford, New York. Oxford University Press. Be sure to visit the sites before directing your students to them. Some are too sophisticated for elementary and middle school students. "Virtual tour of the ear. Click on one of the headings, such as "inner ear" to get started. List of links to educational and health related topics about hearing. Mostly on hearing aids, self-help programs, implants. 1B, 9-12, #3: Sometimes, scientist can control conditions in order to obtain evidence. 4E, 6-8, # 2: Most of what goes on in the universe involves some form of energy being transformed into another. 6C, 6-8 #6: Interactions among the senses, nerves, and brain make possible the learning that enables human beings to cope with changes in their environment. 6C, 9-12, #2: The nervous system works by electrochemical signals in the nerves and from one nerve to the next. 6D, 9-12, #3: Communication between cells is required to coordinate their diverse activities.